Looking to take a bite out of the luxury sector but can't afford the high price tag? Maybe you should consider a nibble, instead. Over the past year, experts said they have begun to see the return of the "aspirational" shopper—someone whose income isn't high enough to make them a true luxury buyer but still has an appetite for designer duds. Although these consumers are still on the hunt for chic items that make them feel like a 1 percenter, they're doing so in a much different manner than before the recession, when they were willing to rack up thousands in credit card debt to snag a $4,000 Chanel purse. Instead, today's aspirational shoppers are more rational about their luxury purchases, buying smaller items that come with a lower price tag, choosing accessible brands that offer a range of products at a lower cost, and hitting the outlets and other off-price stores to hunt for deals. In other words, they're trading up instead of stretching up. "What we've seen in the past year is that the aspirational consumer is coming back, but is coming back in a true sense of trading up," said Hana Ben-Shabat, a partner in the retail practice of A.T. Kearney, a global management consulting firm. Before the recession, aspirational shoppers—often people with a household income of about $100,000—were responsible for a large chunk of consumer spending, Ben-Shabat said. But when the economy dropped off in 2008, they disappeared from shopping centers and online stores along with the rest of the population. As the economy started to show signs of stabilization, evidenced by a better employment picture, lower gas prices and a steadying housing market, the mid-tier shopper was more reluctant to ramp up their spending habits. Over the past year, however, they have begun gravitating toward smaller-ticket designer items, such as sunglasses or beauty products, so they can once again satisfy their need for indulgence without breaking the bank, Ben-Shabat said. "It gives them the opportunity to participate in the brand without stretching themselves," she said. This has steered many shoppers toward brands such as Fifth & Pacific's Kate Spade or Michael Kors, which offer a number of handbags for $300 or less. By comparison, higher-end labels such as LVMH's Louis Vuitton typically price even a small handbag at more than $1,000. A quick look at Kors and Kate Spade's business backs up Ben-Shabat's point. Michael Kors has been on fire since its initial public offering two years ago, most recently posting quarterly domestic same-store sales gains of 21 percent. Fifth & Pacific has been putting all its muscle behind the popular Kate Spade brand, recently announcing the sale of its Juicy Couture and Lucky Brand units to focus on its growth. Shannen O'Neill, 20, was out browsing the Free People apparel section at Nordstrom Rack's Union Square location in New York on Wednesday. She was looking for a birthday present for a friend who likes designer goods, but she and two other friends didn't want to spend more than a combined $200. O'Neill said they went to Rack because they have "such great deals on designer things," which is important since she and her friends, who are still in college, don't have a lot of money. "I prefer, obviously, not to [pay full price], so I normally tend to not go into the designers' stores just so I don't," she said. Luxury brands are making an effort to bring back shoppers like O'Neill, in an attempt to boost the segment's slowing sales. According to Bain & Co., the luxury market will grow just 2 percent in 2013, trailing behind three straight years of double-digit gains. Despite the strides being made by the aspirational shopper, Bain said it's the high-end luxury purchases that continue to outperform the market, so recapturing a broader customer base is important to the segment's growth down the line. Sarah Quinlan, senior vice president, market insights for MasterCard Advisors, said the luxury market showed renewed signs of strength in November, when it posted the largest growth rate since March 2010. She noted, however, that she doesn't think it can maintain this momentum through the holiday season. As a result, some companies have begun adapting to the aspirational trend by doing better job of meeting shoppers' needs, experts said. At Kors, this includes the planned expansion of its watch category, which is typically accompanied by a price point around $200. Kors, along with fashion-industry favorite Marc Jacobs, also launched a beauty line earlier this year, which sells $25 lipsticks and is available at mid-tier department store Macy's. "Retailers are finding ways to understand their customer better and modify, as we call it, the luxury quotient," said Tom Jacobson, managing director of Accenture's Pricing & Profit Optimization practice. Outlets have also become a popular channel for designer labels and department stores. According to estimates from Bain, the off-price luxury market will grow by 24 percent in 2013, on top of the 30 percent gain seen in 2012. In its third-quarter earnings statement, Nordstrom said its off-price Rack stores have contributed 23 percent of the company's net sales so far this year, and it plans to open roughly 30 more locations in 2014. Coach will also increase its already heavy off-price presence by opening 20 new factory units in 2014. Already, Wells Fargo analyst Paul Lejuez estimates that four out of five Coach handbags sold at U.S. retail come out of a factory outlet, he said. Off-pricers such as TJ Maxx provide another opportunity for bargain hunters, as do H&M's designer collaborations, which most recently drew a crowd for its tie-up with French runway designer Isabel Marant. TJ Maxx parent company TJX has been listed as a top pick this holiday by analysts, including Stifel Nicolaus' Richard Jaffe, who cited its compelling assortment and value. "People are aspirational in terms of the brands they want to own and wear, but I think they are as particular as ever in terms of really requiring a discount and really waiting for sale periods to make those purchases," said Lejuez. Accenture's Jacobson said there has been a generational shift among today's young shoppers, who have come to be "conditioned for the rebate, or discount, or financing." This shift will last much longer than the luxury items they buy, and will have long-term implications on the segment, he said. "It's the [question of] luxury or the egg?" he said. "Did the access come first, or did your need come first? The both seem to coexist well." On the flip side, higher-tier brands are also doing a better job of reaching the aspirational consumer through social media and advertisements, which position pricier items, such as apparel, next to their lower-ticket products, such as sunglasses, A.T. Kearney's Ben-Shabat said. Another way aspirational shoppers have evolved is in their desire to shop online. 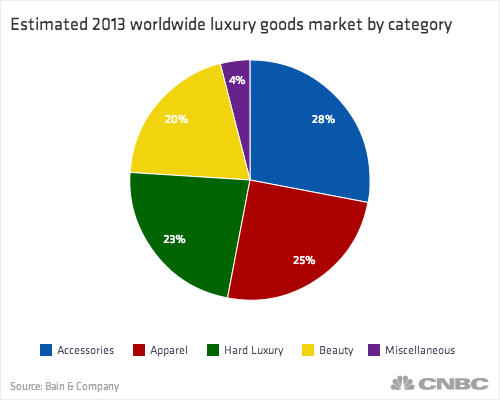 The personal luxury goods market is expected to grow its online sales by 28 percent in 2013, on top of last year's 33 percent gain, according to Bain. The off-price market makes up nearly a third of this segment, including flash-sale sites such as Gilt Groupe. Gilt CEO Michelle Peluso told CNBC that its Black Friday weekend sales were "phenomenal" in 2013, rising 45 percent on the year. Some have speculated that Gilt, along with online home goods discounter One Kings Lane, will go public, but Peluso said the company is not in any rush. What's more, Nordstrom's flash-sale site, HauteLook, has seen same-store sales rise by more than 25 percent this year, boasting nearly 15 million members. Still, there is much more room for luxury to grow in the online space. According to Bain, 40 percent of high-end brands still do not sell online, which can be a major disadvantage to brands looking to recruit new customers. Harley Finkelstein, chief platform officer for Shopify, a company that powers the websites of more than 80,000 retailers, said luxury brands with an online presence have an opportunity to create an emotional bond with consumers before they even see their product. "It's a much tailored experience for the merchant," he said. Experts agree that those companies who meet consumers' needs will be the ones who succeed in bringing back the aspirational shopper. "Luxury brands cannot think that the aspirational consumer is coming back in the same way as they were before the recession," Ben-Shabat said.